It goes without saying that I was very excited to make a repeat visit to this masterpiece in the woods. It is such a sweet spot. But what is, in some ways, even more exciting, is that this field trip allows me to see what I think are improvements to my drawings. Despite [or perhaps because of] the fact I sketch nearly everyday, rarely do I see my significant growth. Enter sketches from the same locations spaced exactly one year apart. The differences might not be mind-blowing [particularly to anyone besides me] but there are changes nevertheless. This is exciting. 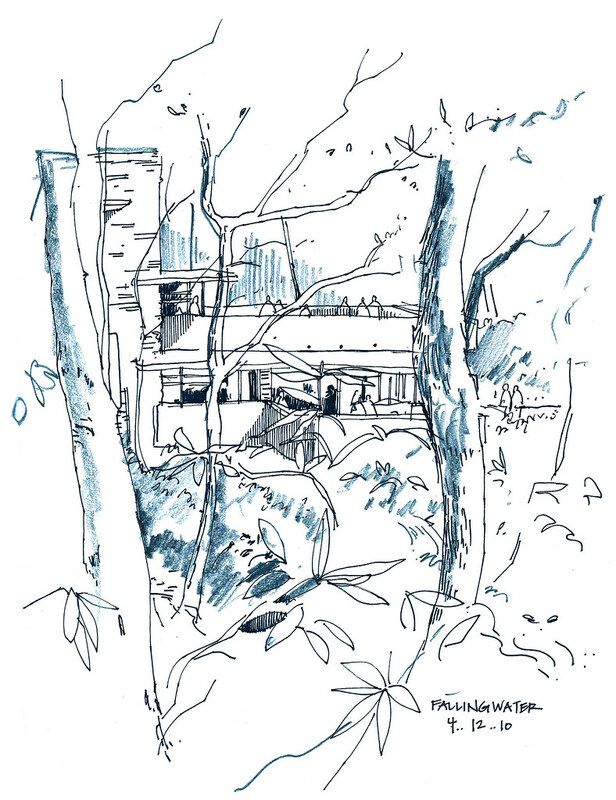 See last year's sketches from Fallingwater here and here, and Monticello here. The color strokes added to the black lines really makes your artwork zing. love the view through the trees. love all your lines of brush, building detail, & peeps. 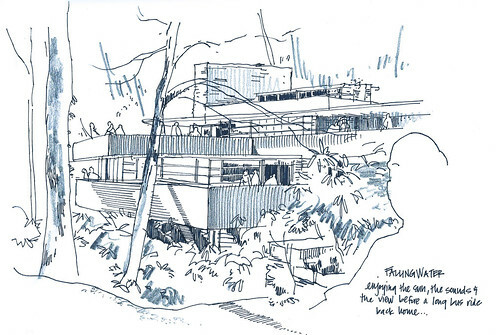 Lovely sense of perspective, Suzanne, especially in the first sketch! In the second one, there is a sense of the "bigger picture" that is very nice. love the depth of field and framing in the new one! One of these days, we'll make it to Fallingwater. We went to Monticello last week, but I barely took photos, let alone sketch. :} I'll just enjoy your sketches instead. your eye for detail is amazing and makes me want to look at my environment more closely! sometimes i'm oblivious to small but significant changes... i try to take in too much at once and because of it i sometimes miss everything! how wonderful that you have the gift and skill to translate this all to paper! such a beautiful place...lucky you to get to go back! Trees, trees, rees! Good stuff. I would suggest only to add a little more texture to the trees in the foreground - other than that, excellent as always. This is my first time on your blog, and I loved it! Brilliant! just wanted to say that your drawings inspire me to sketch more!